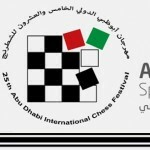 Abu Dhabi Chess & Culture Club is organizing the Abu Dhabi chess festival in cooperation with Abu Dhabi Sports Council and under the Patronage of H.H Sheikh Nahyan bin Zayed Al Nahyan from 6-16th August in Abu Dhabi, the capital city of the UAE. In Group A 158 players took part. Before the last round GM Anton Korobov was leading with 7 points but he drew his game against GM Sargissian. GM Dubov defeated GM Ivan Cheparinov and GM Salem won against GM Aravindh. So after 9 rounds three players have finished with 7,5 points. GM Daniil Dubov is the winner of the 25th Abu Dhabi Masters with the best tie-break ahead of GM Korobov and GM Salem. Sargissian is the only player with 7 points. Rapport, Wang Hao, Fedoseev, Cheparinov, Amin, Maghsoodloo, Karthikeyan, Jojua, Harsha, Abdusattorov, Debashis have finished with 6.5 points.